"Hébertville" redirects here. For other uses, see Hébertville (disambiguation). 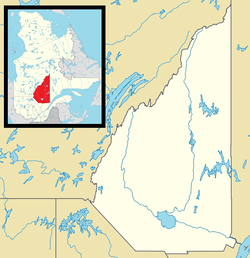 Hébertville is a municipality in Quebec, Canada. Hébertville was founded in 1849. It was the first establishment to be colonised in the Lac Saint-Jean area. This municipality offered a future development near the Aulnaies Falls, situated at the heart of the village. At this location, saw and flour mills were constructed to provide work and food for the first inhabitants. ^ a b "Hébertville census profile". 2011 Census data. Statistics Canada. Retrieved 2010-10-29. This page was last edited on 29 July 2017, at 02:04 (UTC).